Alcoholism can be defined by a compulsion to seek and take drug, loss of control in limiting intake, and the emergence of a negative emotional state when access to the drug is prevented. Alcoholism impacts multiple motivational mechanisms and can be conceptualized as a disorder that includes a progression from impulsivity (positive reinforcement) to compulsivity (negative reinforcement). The compulsive drug seeking associated with alcoholism can be derived from multiple neuroadaptations, but the thesis argued here is that a key component involves the construct of negative reinforcement. Negative reinforcement is defined as drug taking that alleviates a negative emotional state. The negative emotional state that drives such negative reinforcement is hypothesized to derive from dysregulation of specific neurochemical elements involved in reward and stress within the basal forebrain structures involving the ventral striatum and extended amygdala, respectively. Specific neurochemical elements in these structures include not only decreases in reward neurotransmission, such as decreased dopamine and γ-aminobutyric acid function in the ventral striatum, but also recruitment of brain stress systems, such as corticotropin-releasing factor (CRF), in the extended amygdala. Acute withdrawal from chronic alcohol, sufficient to produce dependence, increases reward thresholds, increases anxiety-like responses, decreases dopamine system function, and increases extracellular levels of CRF in the central nucleus of the amygdala. CRF receptor antagonists also block excessive drug intake produced by dependence. A brain stress response system is hypothesized to be activated by acute excessive drug intake, to be sensitized during repeated withdrawal, to persist into protracted abstinence, and to contribute to the compulsivity of alcoholism. Other components of brain stress systems in the extended amygdala that interact with CRF and that may contribute to the negative motivational state of withdrawal include norepinephrine, dynorphin, and neuropeptide Y. 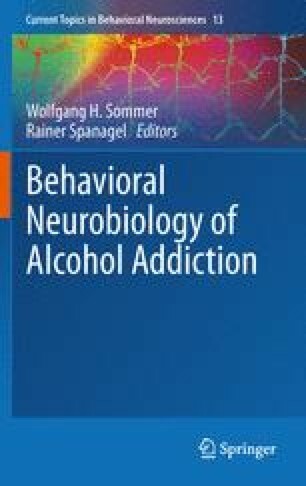 The combination of loss of reward function and recruitment of brain stress systems provides a powerful neurochemical basis for a negative emotional state that is responsible for the negative reinforcement driving, at least partially, the compulsivity of alcoholism. The author would like to thank Michael Arends for assistance with manuscript preparation and editing. Research was supported by National Institutes of Health grants AA06420 and AA08459 from the National Institute on Alcohol Abuse and Alcoholism and the Pearson Center for Alcoholism and Addiction Research. This is publication number 20763 from The Scripps Research Institute.